Mont Blanc is the highest mountain in western Europe, with a summit of 15,781 feet. Located on the French/Italian boarder in the Alps, the peak rises 12,337 feet above the town of Chamonix, France. It is considered by many, to be the birthplace of mountain climbing. 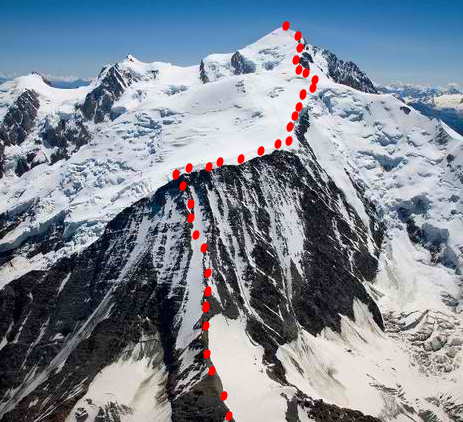 Of all attempts, only half are successful with over 30% of climbers returning with injuries such as frostbite, crampon wounds or altitude sickness. The summit of Mont Blanc provides less than 1/2 the oxygen that of sea level, making it very difficult to breathe. 79% of people returning from Mont Blanc suffer from AMS – Acute Mountains Sickness – due to poor high altitude acclimatization. With these thoughts in mind, we set off for Chamonix with aclimatization as a top priority. We will be attempting the Gouter Route. The meaning of it’s name, “White Mountain”.